Dave Savini is one of the most trusted reporters in Chicagoland. I visited the new studio close to Chicago City Hall and went through all the new floors on block 37. CBS channel two news had some reception issues as the suburbs expanded. This cost some customers. I get the feeling when the digital law transfers soon, the signal problem that was a disadvantage for so long might make this station a comeback kid. Many of Chicago’s channel two stars were very polite to me. I also met the big boss, Mr. Ahern and he was very nice. 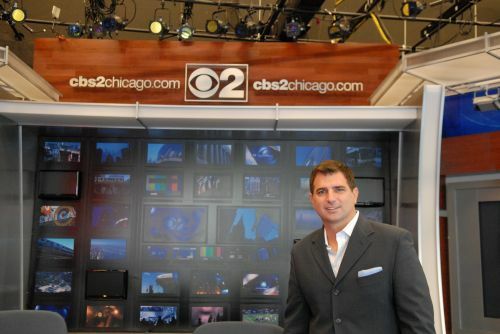 I sense CBS 2 News in Chicago is very hungry to become the top station again. Please make sure you read and watch the video of the beating Chicago School kids took from teachers. Here: http://cbs2chicago.com/investigations/cps.chicago.public.2.835842.html These teachers belong in jail. Thank you to Mr. Savini and his wonderful Investigative Producer Michele Youngerman. Thank you again for the visit, the new station is state of the art!!! Photo by Patrick McDonough. Dave Savini, I have a thought on the Chicago schools and their costs/cutbacks. I am willing to hear from you and answer any questions but I do not want on your news. I dated a man some time ago that was a maintenance man for the Chicago school systems. His expertise was in boilers although I am not sure waht other projects he may have done. Most of his days he would tell me he slept because there was nothing to do. There was alot of theft from the schools in order to keep their budget for the following year. They would order tools and other things for their personal use when there was money left over at the end of the year. I had heard of them backing trucks up to the schools and stealing brand new snow blowers because they could. Any who it is a thought for your team to investigate the expenditures in this area and increasing loss to the students in the Chicago School system (Response) You need to contact cbs2 chicago and ask for Dave Savini. While you are at it take pictures.